I have worn an undershirt for as long as I can remember. I don’t even think about it anymore. But with his beautifully curious mind, my son wanted to know why a person would do this. 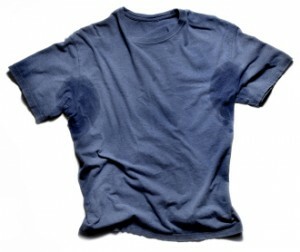 I told him: So I don’t sweat. He then asked: Why don’t you wear two shirts when you run? Another good point. So for the rest of the day I was stumped about why I need an undershirt. Is it because I don’t want people to see me sweat in other contexts? Should I care? What would it be like to not wear an undershirt? If you skip over my neurosis about a simple issue, there is something brilliant about what my son did. He took something I take for granted and simply asked: Why? He had no malicious intent. He had no agenda. He just wanted to understand why I did what I did. At what point do we lose this kind of curiosity. At what point do we become so ingrained in what we do that we no longer bother to ask: Why? I think asking “Why?” is an important task. But it can be a dangerous question. My four-year old has no issues asking the question. He is just curious. He is still discovering how the world and people work. He is not concerned that the question will disrupt his way of living. I think we stop asking why because we realize how disruptive it can get. This week, we are talking about facing the darkness. We tend to avoid darkness. We avoid admitting the darkness in our lives and we either run from or get very loud about the darkness in others. When it comes to darkness, we live with a lot of fear. One of the reasons we are scared of the “Why?” question is because it can easily expose the darkness we work so hard to avoid. When we ask why we have to explore motives and habits. When we ask why we have to explore structures and systems. When we ask why we push on assumptions and faulty reasoning. When we ask why we have to explore reality and truth. The question of “Why?” wants to help us see life the way it truly is. We often do not want to see that. It is easier to deny and avoid. Exploring habits, motives, structures, etc. will inevitably lead us to another very scary area: Change. When I start asking questions about why I do what I do (or what churches do or Christians do), I will inevitably find some disturbing patterns. We all know how flawed we are, but if we don’t spend much time thinking about it, we can probably just get away with it. But if I start asking questions, I may have to re-think some things. I might have to change how I do things. I might have to dive deeper into some tough issues. We don’t like to do that. It is always much easier if we can avoid the harsh realities of life and simply maintain the status quo. 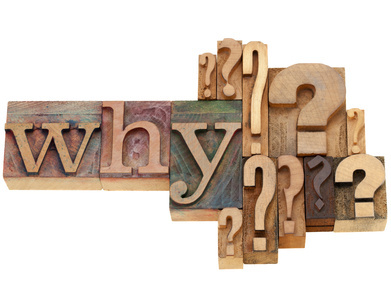 Asking “why” challenges our beliefs, ways of living, and our systems of power and control. These are the things we tend to be most protective of. We spend a great deal of energy trying to protect them. So to challenge them can be terrifying. But one of the beautiful things about Jesus is Jesus teaches us not to fear. We should never fear darkness. Darkness cannot dispel light. It has no power over light. In fact, all darkness is is the absence of light. If we really believe in light, then we have no need to fear darkness. And while change is always difficult, it is the nature of being human. It is built into the fabric of who we are. This requires us to constantly be looking at our lives, our world, and our ways of living out our faith. Change is occurring whether we like it or not. So we have to learn to adapt. This is especially important in matters of faith. Jesus wants to speak to our real situation. He wants to show us how we can have the fullest life available right where we are. But if we refuse to explore where we are, we block our ability to listen. The Pharisee knew what he did. But he had lost sight of why he did it. The tax collector had a firm grip on reality. He knew his brokenness and was willing to face it. And Jesus ends the parable by telling us only one was ability to really listen to God. Jesus wants to speak to the real places, people, and issues in our life. But are we willing to ask hard questions so we can see those realities more clearly? This entry was posted in Ordinary Days and tagged Courage, Darkness, Faith, Fear, Habits, Light, Motives, why. Bookmark the permalink.